At any rate, to follow up on yesterday’s post, I dug through my tea shelves and pulled out something I’d been hesitant to drink for a long time, both because of its origin and because it’s supposed to be mostly malt and honey (two things i can’t have). Hopefully i can teach myself this whole sip & spit thing. Laos Black #05 from Steepster was sent to me on their Tea of the Month club when I signed up briefly a couple years back. According to my research, Laos Black #05 is actually from 2010. Not sure if it’ll still be any good but it was quite well packaged. Yet, putting aside the tea itself, it’s been almost a year since i last reviewed anything curated by Steepster and they do seem to have a good nose for tea. In aroma Laos Black #05 is reminiscent of a Darjeeling FTGFOP and its coloring looks similar to a 2nd flush of that terroir. To be specific Laos Black #05 has a dusty, malty and decidedly honeyed Ceylon-like Black leaf aroma. Laos Black #05’s liquor tone is actually shade or two more chocolate than either your average Ceylon or Darjeeling though. I’m not overly taken with its taste however. Despite it’s look and smell, Laos Black #05 tastes more-so like an Irish Breakfast than a real full-leaf orthodox Black. It is honeyed and altogether malty, but there’s also an odd bitter/metallic/nettley undertone and a smidgen of astringency. Steepster’s page claims Laos Black #05 has among its flavor components “baked bread”, “roasted barley” and… “Earth”. Yeah okay, whatever. 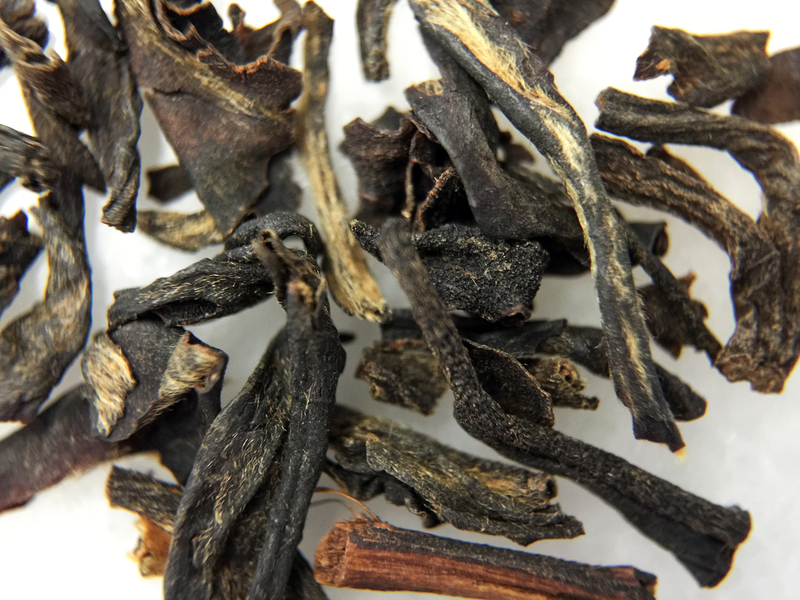 In terms of its texture, Laos Black #05 feels more similar to an Indian BFOP or a Ceylon OP: a definitely gooey Black, if less complex than its contemporaries. To be blunt, it feels a bit burnt. If you enjoy honeyed Black tea and/or Irish Breakfast though, Laos Black #05 will not disappoint. Or, in other words it rounds up to a 95, making it our first Best in its Class for the South East Asian Black category. In truth, that’s not too surprising given how selective Steepster tends to be with its offerings. It is odd then, given that I do enjoy Irish Breakfast, that i don’t really care for Laos Black #05 all that much. In order to test the color cast and depth of field on my new Nexus 6P cellphone camera, I shot everything twice: one set with my old iPhone 6 Plus. The exception are the Macro crops which are made possible only on the iPhone (and with many humble thanks to Olloclip). I bet you didn’t realize this was a digital camera review blog. Hey, i can dream. Laos Black #05 (Steepster) ~ loose leaf (iphone) by jocilyn mors is licensed under a Creative Commons Attribution-ShareAlike 4.0 International License. Laos Black #05 (Steepster) ~ loose leaf (nexus) by jocilyn mors is licensed under a Creative Commons Attribution-ShareAlike 4.0 International License. Laos Black #05 (Steepster) ~ loose leaf macro 14X by jocilyn mors is licensed under a Creative Commons Attribution-ShareAlike 4.0 International License. Laos Black #05 (Steepster) ~ loose leaf macro 21X by jocilyn mors is licensed under a Creative Commons Attribution-ShareAlike 4.0 International License. Laos Black #05 (Steepster) ~ spent (iphone) by jocilyn mors is licensed under a Creative Commons Attribution-ShareAlike 4.0 International License. Laos Black #05 (Steepster) ~ spent (nexus) by jocilyn mors is licensed under a Creative Commons Attribution-ShareAlike 4.0 International License. Laos Black #05 (Steepster) ~ liquor A (iphone) by jocilyn mors is licensed under a Creative Commons Attribution-ShareAlike 4.0 International License. Laos Black #05 (Steepster) ~ liquor A (nexus) by jocilyn mors is licensed under a Creative Commons Attribution-ShareAlike 4.0 International License. Laos Black #05 (Steepster) ~ liquor B (iphone) by jocilyn mors is licensed under a Creative Commons Attribution-ShareAlike 4.0 International License. Laos Black #05 (Steepster) ~ liquor B (nexus) by jocilyn mors is licensed under a Creative Commons Attribution-ShareAlike 4.0 International License.